Being a woman with hair loss can be devastating. 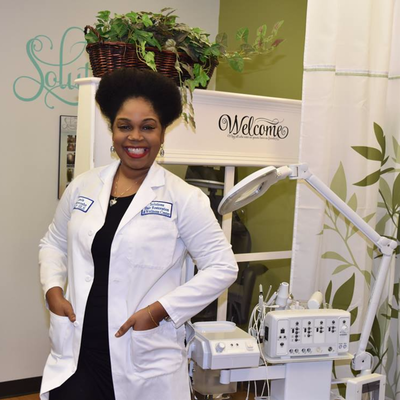 Trichologist Leola Anifowoshe will show us how the science of the structure and function of the hair can help with this problem. Everyone deals with hair loss differently. For some it's just a fact of life, for others it's a source of anxiety and depression. It is hard enough for a man to lose his hair, but at least it is socially acceptable. 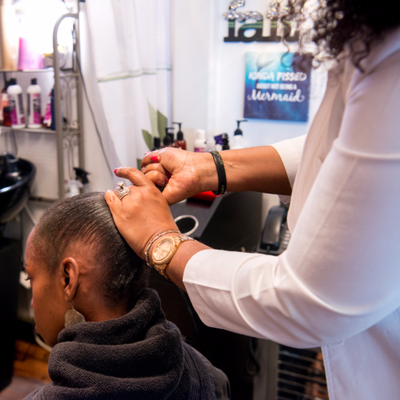 For a woman losing her hair, the experience can be one thousand times more difficult. Confusion, fear, and anxiety can set in and the feeling of helplessness is dominant. Nearly 40% of women by age 60 experience some form of hair loss. It's no longer about male hair loss versus female hair loss. The cause may be very different but the solutions are quite straightforward. An initial consultation is expected to last up to an hour and will give patients the opportunity to discuss problems in confidence. During this time the Trichologist will ask many questions on topics like. 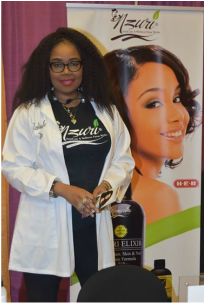 Hair care regimen, Medical history, Lifestyle. Nutrition. Stress. She will also perform a microscopic examination of the hair and scalp. Oftentimes, a scalp and hair analysis is required. It is helpful to take with you to this first consultation details of any medications that you are taking and results of any recent blood tests that you may have had. 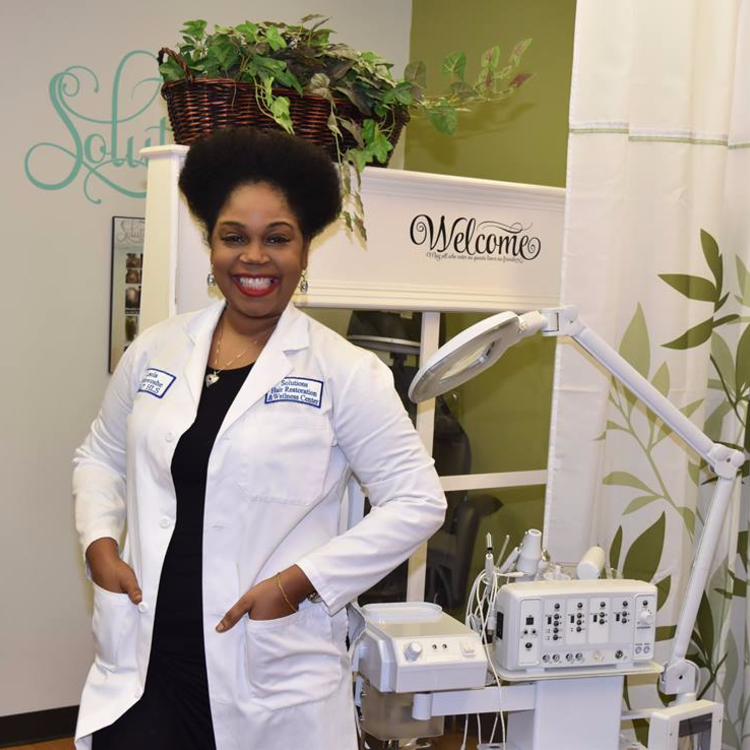 The Trichologist will also take a holistic viewpoint, giving consideration to various aspects of lifestyle and diet and care and management of the hair (including sensitivities and allergies suffered) before a suitable hair regrowth system for the hair and scalp can be recommended. There are other reasons, apart from hair loss, scalp problems and hair texture problems, that you might wish to consult a Trichologist, one of which is for sound, professional advice on keeping your hair and scalp in good condition and thereby avoiding many of these problems in the first place. Diffuse (“all over”) hair loss from a nutritional disturbance, primarily low iron levels. With the current prescription medication available the causes of female hair loss may be as simple as the wrong choice of contraceptive or the effects of an endocrine tumor requiring immediate medical intervention. Half a century ago female genetic thinning was almost exclusively a problem of post-menopausal women. However, in part due to the advent of synthetic hormones used in contraceptive and hormone replacement therapies there has been an exponential rise in the numbers of younger women developing genetic thinning. Female pattern baldness (genetic thinning) is characterized by a progressive thinning-out of the top, temple and/or crown areas of the scalp. 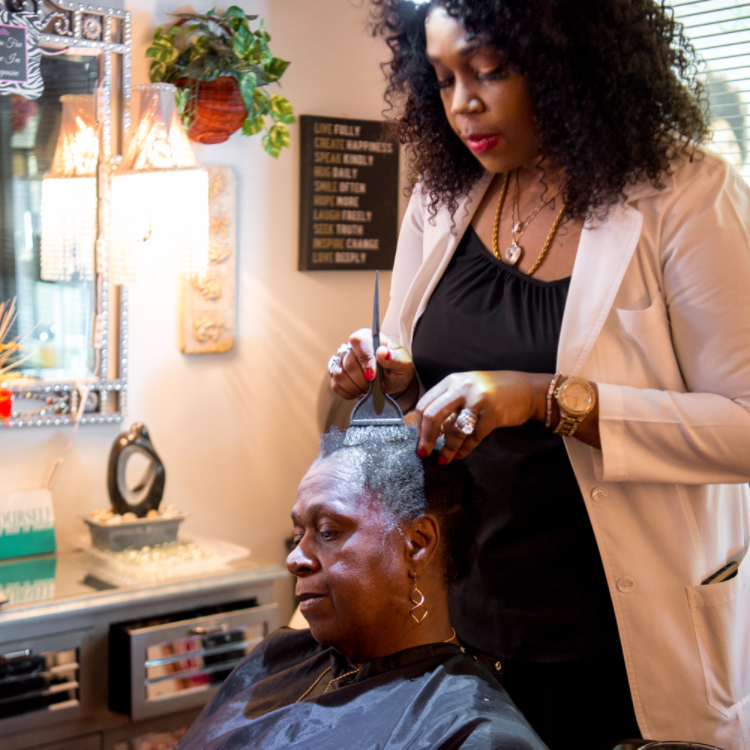 Unlike men’s genetic hair loss, not all the hair follicles across the top of a woman’s scalp are affected – thus ‘thinning’ of the hair density occurs rather than total baldness. The numerous factors having the potential to both initiate and/or impact female genetic thinning make it essential for a careful and detailed history to be taken by the treating practitioner. Circumstances surrounding the onset of the problem, signs/symptoms of hormonal disturbance, menstrual or reproductive difficulties, and current contraceptive/hormone replacement therapy are the predominant issues to explore. For some time now the accepted treatment regime for female androgenetic alopecia has centered on some form of oral hormonal therapy, either as prescription anti-male hormone medication (Androcur/Aldactone) or phytohormones. 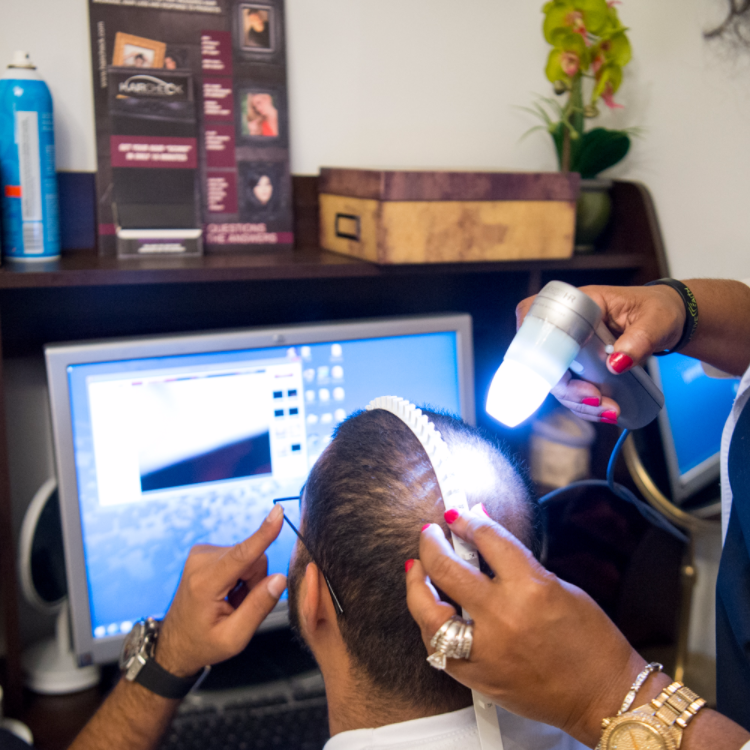 However, through modern technologies such as laser therapy coupled with Minoxidil topical solution is now considered the specific treatment regime for hair loss of hormonal origin. There are now more advanced non surgical therapies available that has proven to also be effective in treating this condition. Hormonal profiling is the specific way to assess whether or not a woman’s hormones are in balance. However, because pre-menopausal hormone levels often vary from day to day, it’s vital that “patterns” of symptoms over time are assessed, and assessed in conjunction with the woman’s “total picture” of diet, stress levels, lifestyle, medical history, and blood test results. Diffuse hair loss is excessive hair loss from all over the entire scalp. Because the growing hair is very sensitive to nutritional, metabolic or environmental disturbances, hair is often one of the first areas of the body to reflect disturbances in physiological functioning. When hair loss is subtle, slowly thinning out over many months or even years, the underlying cause is likely to be a nutritional or metabolic disturbance. That is why at Solutions Haiir Restoration Center we utilize a multi therapeutic approach. Our success is derived from the multi-therapeutic combined approach to hair loss management.